Fabbri G, Zarone F, Dellificorelli G, Cannistraro G, De Lorenzi M, Mosca A, Sorrentino R. – Int J Periodontics Restorative Dent. 2014 Mar-Apr;34(2):165-77. doi: 10.11607/prd.1769. 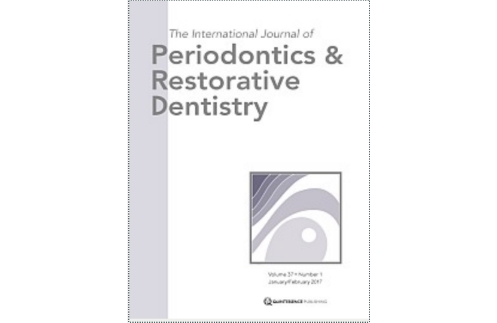 This study aimed to assess the clinical performance of lithium disilicate restorations supported by natural teeth or implants. Eight hundred sixty lithium disilicate adhesive restorations, including crowns on natural teeth and implant abutments, veneers, and onlays, were made in 312 patients. Parafunctional patients were included, but subjects with uncontrolled periodontitis and gingival inflammation were excluded. Veneers up to 0.5 mm thick were luted with flowable composite resin or light curing cements, while dual-curing composite systems were used with veneers up to 0.8 mm thick. Onlays up to 2 mm in thickness were luted with flowable composite resins or dual-curing composite cements. Crowns up to 1 mm in thickness were cemented with self-adhesive or dual-curing resin cements. The observational period ranged from 12 to 72 months, with a mean follow-up of 3 years. The mechanical and esthetic outcomes of the restorations were evaluated according to the modified California Dental Association (CDA) criteria. Data were analyzed with descriptive statistics. Twenty-six mechanical complications were observed: 17 porcelain chippings, 5 fractures, and 4 losses of retention. Structural drawbacks occurred mainly in posterior segments, and monolithic restorations showed the lowest number of mechanical complications. The clinical ratings of the successful restorations, both monolithic and layered, were satisfactory according to the modified CDA criteria for color match, porcelain surface, and marginal integrity. The cumulative survival rates of lithium disilicate restorations ranged from 95.46% to 100%, while cumulative success rates ranged from 95.39% to 100%. All restorations recorded very high survival and success rates. The use of lithium disilicate restorations in fixed prosthodontics proved to be effective and reliable in the short- and medium-term.